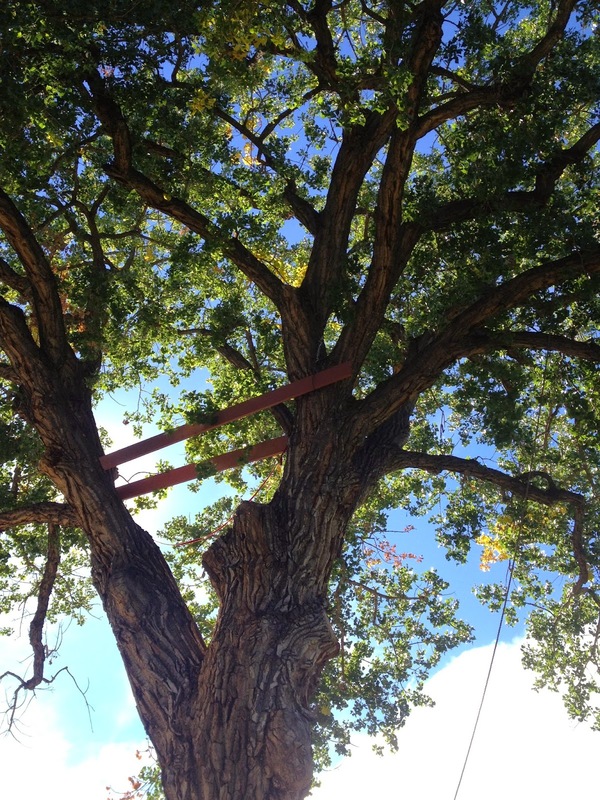 The Treehouser: Part 9: The Second Treehouse Beam, and Video! Tackling the second treehouse beam was much like the first — although I decided to simply drag the 2x12 into the tree and muscle it around this time, without going through the hassle of the elaborate pulley system. It was a little tougher, but saved me a ton of time; I had the beam strapped in place by lunch. And my daughter wanted to climb up and look. I figured I could use the rest. 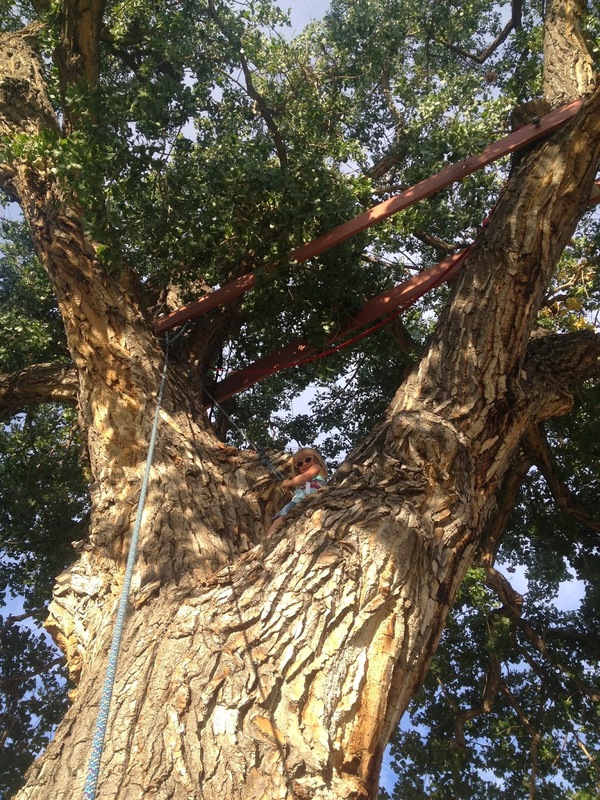 Drilling for the treehouse bolts was accomplished again with the help of the ladder, and roping myself in for safety. The left or “pivot” hole was drilled more or less without incident as well. Note: if you want to watch these videos in HD (e.g. bigger and sharper), visit my YouTube Channel. Protip: When your wife asks how it's going, resist the urge to go on and on about how exhausted you are, take a breath, and give the correct answer. To make life easier, I’d invested in an aluminum pipe wrench — still heavy, but not as heavy as the steel models. And a bit longer, so I could turn harder. Stunning footage of wrench ascending the tree. OK, not that stunning. Equally riveting (!) 23 seconds of wrench turning. For posterity, I suppose. For the bolt on the right, I wasn’t able to put the ladder anywhere where it was stable and near where I wanted to put the hole. It's difficult to see, but drilling from the ladder would've meant holding the drill above my head and behind me. Nope. I wanted to make this side just like the other, with the wire hanging straight down from the treehouse bolt. 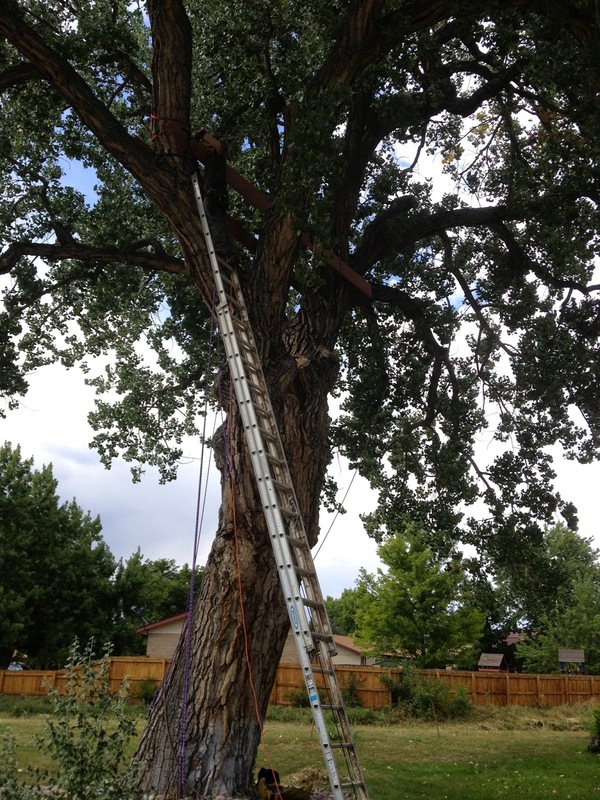 But after a few hours trying to place the ladder, and another few climbing around in the tree, it dawned on me that I could put the hole 90 degrees offset and it would hang just fine — plus I’d be drilling from a much easier position, in the tree rather than on the ladder. 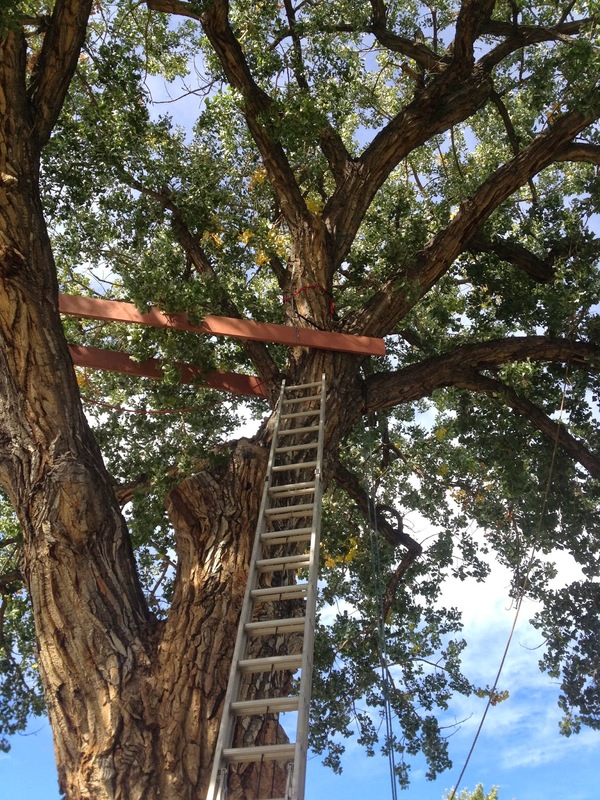 It worked; the two main treehouse beams were in place. They were rock-solid, perfectly overbuilt, level, and ready for my platform. Pretty amazing, even as I look back on it. Unfortunately, weather was starting to set in. I knew I’d have to wait until spring to start any major projects in the tree, which gave me all winter to line everything up for a quick treehouse build when things warmed up.